Moving from retail to digital distribution is an intimidating prospect for the biggest of developers, let alone a small team with the noble goal of reaching a niche market regardless of location. But by starting small and staying in touch with its community, Paradox has gradually built the service that its player base wanted. "We have had the opportunity to learn a lot of what the customers would like to see, and how they would like things to work," says Paradox CEO Fredrik Wester. "We've been working very closely with our customers to provide the services and titles they've been asking for. Having our own platform has made it easier to experiment." One thing customers would like to see is more content for their favorite games. Thankfully, digital distribution makes it easier to get add-ons into the hands of players. "New ways of reaching customers, like downloadable content, will be a new way for customers to increase the lifespan of their favourite game," Wester says. 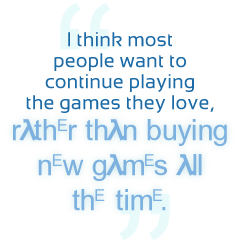 "I think most people want to continue playing the games they love, rather than buying new games all the time." For those who want more variety in their gaming experiences, GamersGate's current library of over 1100 titles offers plenty to choose from, and that number will only continue to climb. "Another ambition we have is to build a big catalogue of games from both triple-A publishers and smaller indie developers," Wester says. It's clear from its wide range of available titles, from Fallout 3 to Braid, that GamersGate strives to ensure every game gets as much attention as possible - after all, big names aren't always a symbol of quality. Of course, Paradox accepts that GamersGate isn't the only option for getting their games into the hands of players, nor should it be. "We use all digital distribution channels that are interested in working with us," Wester says. "Digital distribution is important to Paradox, and we cannot limit ourselves to only one or two portals." Going hand in hand with their willingness to work with other platforms, GamersGate strives for a level playing field for the titles sold through its own service, opting not to give Paradox titles preferential treatment. "GamersGate is first and foremost a retailer so all good games are getting good attention," Bergquist says. "We are already today one of the top tier digital distribution services," Wester says, "and I hope we can stay there." Christos is a freelance videogame journalist living in London. You can find him at his site, www.forthegamergood.com.